Last night I was putting things away in my new home office when I looked out the window into the side yard and caught a glimpse of what looked like blueberry bushes. Okay they are more like trees but that besides the point. I did a double take and then practically knocked over my own children to run outside and confirm that blueberries were in fact growing in my yard. Score. There were hundreds and hundreds of them just hanging there ready to be picked. At first I didn’t think they were ripe because blueberries at the store are so mushy and damaged looking but these were perfect. Tasting them did confirm they were in fact ripe and ready for picking. I know many of you who live where blueberries thrive are thinking, what’s the big deal? Well I have never lived where growing blueberries was a possibility. Thrilled hardly describes the fun I had with the kids last night picking blueberries on the side yard. Pure joy. Even my picky eater tried one. He didn’t like them but at least he tried. It was a big step for him. I’m also surprised the deer who pass through my yard from the golf course to eat the neighbor’s beautiful flowers don’t eat these. Are deer not blueberry lovers? We filled up our ice cream bowls and dessert was served. I had never seen blueberries as large as the ones we picked last night and they were sweeter than anything I could buy at the store. 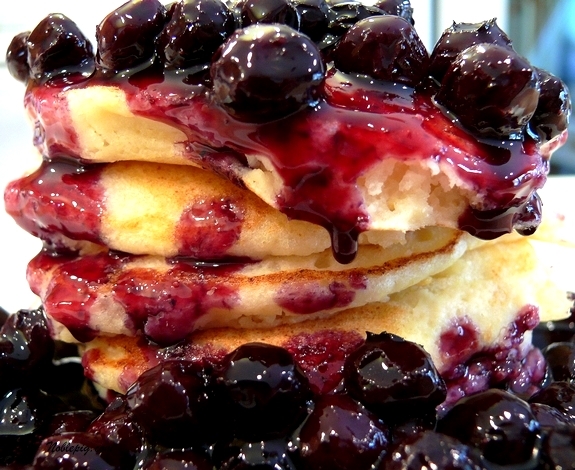 For breakfast we are having this…Lemon Ricotta Pancakes with Blueberry Sauce. But there are so many berries I can’t decide what else to make. I could do Blueberry Crumblies…. 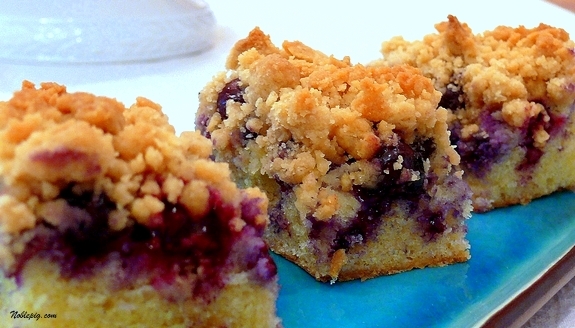 Or Blueberry Streusel Bars with Lemon-Cream Filling. I can’t decide but we have a serious lack of sweets over here. Any great ideas or suggestions? I don’t want to freeze them, I want to make something. You, my lady, are living in blueberry heaven…& I am living in green envy! WOW…they are beautiful Cathy!! Fantastic .. so pleased you moved now -so you get the benefit .. they look delicious .. berries, berries, berries – so good for you ..
we were lucky as kids Mum gardened brilliantly and we had all sorts – but not blueberries: they don’t grow outside London! Crikey, that’s great! A real blueberry tree. I’ve tried to grow one in my suburban yard but our 14 month german shephard dog had other ideas. Luckily my Mum and Dad have a tree and it’s finally fruiting after being in the ground for a number of years. (An 8 year drought doesn’t help, in Tamworth at least). I told you you were living in Paradise on earth! Really, what more could one want? Beautiful scenery accompanied by the kind of weather that grows an abundance of fruits and even the grapes to make a delicious Pinot…hint, hint! I cannot wait for Noble Pig Pinot! Okay, dearie, this is the week I am supposed to be beginning the “big diet!” You are not helping–at all! Thanks for the lovely pix! Sheep C.
I’m already imagining blueberry wine. I just posted a plum tart that I added blueberries to – it was fabulous and super easy. Just blueberries would be amazing too. What a score for real!! Wow, not that is fantastic. I would be in heaven with blueberry bushes. Lucky you! You were meant to live there. You’ve been given such a gift! You know, I loved the part where you found the treats, but the pure joy of picking them with your children was what tugged on my heartstrings. Okay, now I’m seriously jealous of your garden. My blueberry bush is downright anemic… I’ll be lucky if I get 5 all summer. In a large sauce pot, combine milk, vanilla, mint, lemon zest and salt. Bring to a low simmer. Remove from heat and let stand for 15 minutes. Remove and discard vanilla bean (if using), mint and zest. Meanwhile, in a large bowl, whisk together eggs and sugars. Stir in remaining ingredients. Whisk in milk. Grease a 9â€™ x 13â€￾ Pyrex dish with butter. Pour in bread pudding batter. Bake at 350ËšF for 45 minutes. Let cool for 10 minutes before serving. Garnish with powdered sugar, mint and blueberries. I’m sorry I haven’t a recipe but only an idea to balance all of the wonderful sweets. How about a take on a salsa? I have seen salsas with peach or pineapple or even blackberries,surely blueberry will work. Great looking blueberries. We live in North Carolina and here we have a lot of blueberry bushes too. The deer don’t eat them here but the birds sure do. Sometimes we’ve had to cover the bushes to keep the birds away. So……beware of the birds. congrats on the bushes. I made red white and blue bundt cake recently. I am a big fan of the simple blueberry muffins. I also wonder if they would be good as a clafoutis. I also like them with sausages. Blueberry smoothies with plain yogurt are delicious and good for you! (Plus they are pretty!) I know you don’t want to freeze them, but frozen blueberries are a wonderful summer treat – pop ’em right in your mouth still frozen! Or drop frozen berries in your pancackes while on the griddle – perfect! Enjoy ’em….they DO freeze so very well…. Ohhh you are one lucky duck! I am jealous. You should make some blueberry Sangria!! When you have enjoyed all the pure blueberry desserts and such, and you have only a cup left, make a Brambleberry pie. It is the last cup or so of all your berries ( blueberries, raspberries and a few strawberries) and a couple of stalks of rhubarb. If rhubarb is not to your liking, just sub an apple or two. Oh and of course, a scoop of rich vanilla ice cream on top when you serve it up. I am so freaking jealous right now!!!!! I have been dying for blueberry bushes and now I am going to have to look extra hard. Heck that alone make the house worth it. Wow, you did score big! We love blueberries and just picked some wild Maine blueberries while we were on a camping vacation. I made blueberry bread that I plan to post about if I ever get caught up after taking a week off from work. Oh My Gosh—I AM jealous! I can’t believe you didn’t even know until now. 😉 Freeze, freeze, freeze–well after doing what you can with fresh ones! Mmmm–to all the recipes you posted. But that first picture of the full bowl of fresh ones–that is divine. I agree…a blogfest at your place may be in order!!! I am just so jealous right now, but what a BIG surprise and that you didn’t even know. Can them…make blueberry sauce…and blueberry jam. And I would definitely freeze some so you can have treats all year long. You know I grew up in SoCal, so like you, I had no idea what real blueberries were like until we moved back to MA. They are the most delicious blueberry muffins ever. Once you make this recipe you’ll never make another one ever again. It’s like you struck gold! 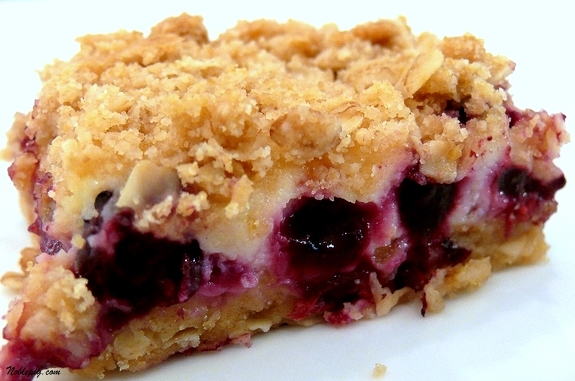 And those blueberry streusel bars are gorgeous. And the sauce looks pretty good also. The heat the next few days will be hard on them so pick like crazy. How lucky Cathy! Mine didn’t really give fruit that many, ad I never got a chance to enjoy them either. I think other creature had them first. Anyway, these dessert look spectacular! I say make ALL of it!! How exciting to find blueberries right outside your window. It’s a coincidence b/c we bought 5 blueberry plants this weekend at a farmer’s market to plant at our new house. Hopefully in a few years–we’ll have plenty to pick too! Lucky you! I just went yesterday and picked at a blueberry farm. Have a great recipe on mt blog! Those look so yummy! My mouth is watering!! Every one of those recipes look amazing… I just bought a tub of blueberries so I am definitely making at least one of them tonight…okay, maybe two! Such a neat find! Having fresh from the bush/tree blueberries! What a luxury! I can’t wait to see what you make! Score is right! 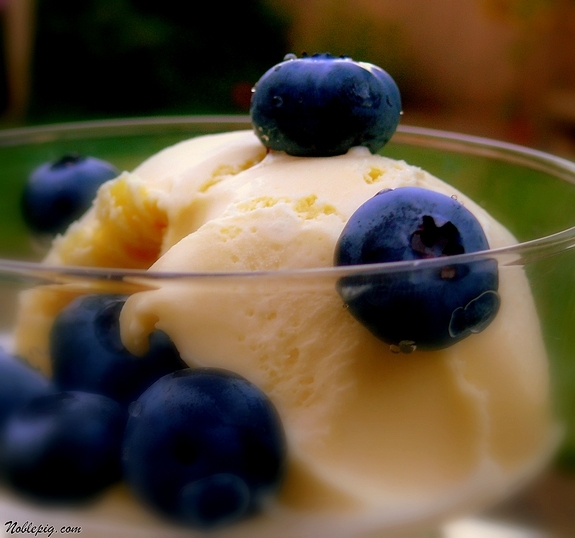 I’d be in blueberry heaven! Since I’m not a huge baker, I’ve either been adding blueberries, raspberries, and walnuts to my yogurt or making a huge fruit salad every morning. If I were to bake something, blueberry muffins are my favorite. Your phots are absolutly incredible. I have never seen bluberries look so good. You definitely scored! 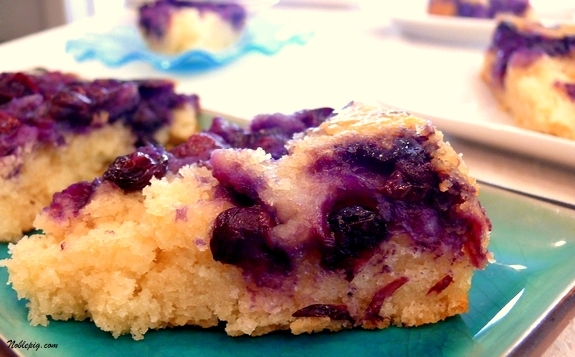 I vote for the blueberry buckle – its one of my favorites! Blueberries are one of my favorite things about living in Maine. We discovered that, despite the rain this year, our raspberries are having their best season yet! Fresh picked berries + little boys = Heaven! folks use to try and train them. I’m so jealous! I don’t live near anything edible! Everything looks so mouth-watering. I love blueberries. We love pioneer woman’s blueberry pie. I also make blueberry bread, blueberry and lemon cookies, blueberry pancakes, blueberry jam. We also love having them on top of our oatmeal and as a treat on top of greek yogurt. How lucky are you? They look wonderful!!! I have a five-minute blueberry tart on my site (other desserts) that might be of interest. You are living in heaven! I’m so jealous! How about scones, pie, cobbler or jam? Lucky you. I love having accessible fresh berries. There are raspberry and blackberries growing at the stable where I ride, but it seems there are never enough ripe ones there when I’m there. I want something closer to home! As for what to make – make it all! We just scarf them down with cream or milk. My third son, fourth son and sixth son delight in fruit trees (and the gardens), thrilled to find “free food” in their own yard! I’m so glad you’ve found that joy, too. Nothing beats berries in the yard. My parents had raspberries and blackberries when I was growing up. Good times. I can’t really help you with blueberries, I don’t care for them myself. smitten kitchen recently did a “blueberry boy bait” and i can attest to both the deliciousness and the appeal of a certain toddler in my life. I am just coo-coo for blueberries. How great that you have them right near your home! I plan on visiting one of my favorite farms in town and doing a little picking. I also love that blueberries keep longer than other berries. Your blog photos are marvelous! Wow! I vote for all of them! Whoa! I’m jealous! I say make all of those desserts (when you have time, of course). 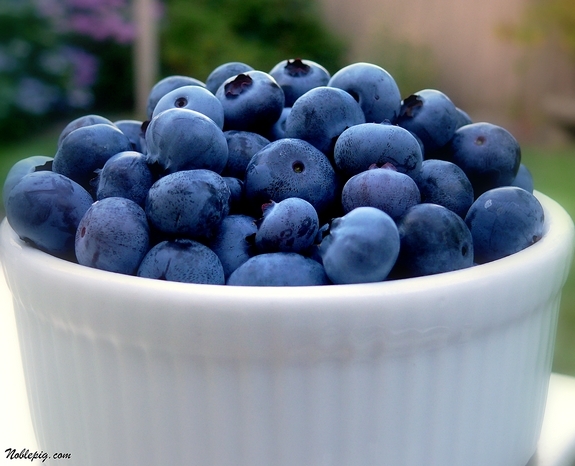 With all those blueberries right in your own yard, why not? wow, that is the ULTIMATE score! Banana bread with walnuts and blueberries would be a great way to put those blue beauties to use. My aunt used to make banana bread like this and it is divine!!! A little cinnamon or orange zest over the top of the loaves (or both) and you have the most delicious flavor explosion! mmm, I really love blueberries. Too bad they don’t grow in the desert. Whenever I find blueberries on sale at Costco, I turn them into preserves. We then top ice cream, pancakes, and whatever else sounds tasty! You’ve got to eat them fresh. Just keep eating! Once you bake them they might as well have been frozen. Once frozen though, blueberry buckle is mighty fine! I am Jealous with a capital J. As far as I am concerned, finding blueberries outside is a big deal, and I would have knocked over my kids too! Lucky you, and looks like you are off to a great start in using them. My thoughts on what you should do. Make some jam so that you can enjoy them on toast during the winter. These look so good! Yummm! Oh my gosh! I am so jealous!! What a treasure to find! Such beauties those blueberries are! Oh, and how lucky are you to have them growing around your home?!? Had a dish in Maine years ago I still remember: Sauteed chicken breast with a fresh wild blueberry sauce. Have no idea how it was done, but I remember it to this day as one of my favorite taste treats. I just made fresh blueberry pie. Not with fresh picked berries, but they looked pretty good for store ones. We don’t have fresh berries around here, which is surprising as Michigan is famous for them and we aren’t far from there. And I’m rambling. and definately freeze some to pull out mid-winter and crank out some awesome dessert. Sounds like you are loving Oregon. I’m jealous! Lucky you!!! That’s like blueberry heaven right there! Lucky you!! One year taking care of my neighbor’s yard while they were away coincided with blueberry season. They had just three bushes but there were bowls and bowls full of luscious sweet berries on those bushes. It was a great pleasure figuring out what to do with them all! I wish I could get my scrawny little blueberry bushes to take at least some interest in producing like that. So far this year my three bushes have only turned out a small handful of berries. You lucky lady! I am so craving blueberries now – especially your pancakes. You are so lucky! When I was a kid we used to travel to pick blueberries in Vancouver, WA (from the east side of WA). We made a dessert my mom called blueberry buckle which involved cream cheese and a crumbly crust, but I don’t remember the whole recipe. It was really good though! Congrats on the BB bushes. Know you are going to make terrific food with them. OMG! I am totally drooling! And totally jealous! The blueberries I just bought contained more tart than sweet ones! These looks so good! OKAY!!!!!!!!!!! Seriously I’m starting to get bugged….I want to be you!!! hahahaha not only a fabulous cook, but beautiful to boot and now you live in the GARDEN OF EDEN…..HOLY SCHMOLY GIRL!!!! I â™¥ BLUEBERRIES!!!!! I grew up in Oregon and had a friend with a blueberry orchard (?) in her backyard. We used to ride her dog like a horse and pick boxes and boxes while eating handfuls. The best, ever. I would like to say that we like the food you cook (we stands for my sister and I, who regularly read your newsletter) and that your cookery is like you are from Serbia – strong and caloric, quite unusual for food mainstream on net. I have a pretty good life with an awesome new house and wonderful yard. It is not often I want to turn green with envy. You just accomplished that however. I too live where the soil will not support blueberries without a lot of treatment and whoooo boy do I feel your excitement. Like I said, green with envy. Oh Cathy that is great. I have been spending every day picking our blueberries for weeks and freezing them. They are the best thing frozen because they truly don’t become mushy like some fruits. I got my picky granddaughter to like them by having her eat the frozen berries and she thinks they are little popcicles. Now she loves them even fresh. Oh those recipes looks so great. I give tons of them away each summer. Last year I had more than 75 gallons in my freezer. Yikes. I have never frozen them so I cannot vouch for how they will taste after they have been frozen. However, I don’t see any reason why they wouldn’t freeze well. I would try it. No Bake Blueberry Cheesecake. Yum. Lots of work for a 60 yr. old cook, but no more than fixing a typical Paul Prudhomme recipe. I’m referring to the blueberry struesel bars that were a big hit with all my family today. I look forward to preparing other recipes of yours and wish you well. I am so happy for you! When I planted my blueberry bushes this year, you told me that you had just had a discussion with your husband about planting blueberrie bushes when you get to Oregon. And now you have more than you know what to do with. Maybe you can study up and take starters from the plants you have there to transplant on your land.